User-generated content creates increased user engagement. People like to voice their opinions. By providing them a platform you create a community. As a part of the community they become advocates for your business. It also creates fresh content on your site. Search engines love fresh content. By allowing for user-generated content you’ve added value to your site at no cost to your business. Or is there? The danger of letting users post anything is that spammers will find your site. They will turn it against you. You need to watch what gets posted on your site. Be a part of the community that resides on your site. Spammers taking over the site kills the experience and drivers users away. Mozilla was recently hit with a spam penalty over user-generated content. Given Mozilla’s important to the internet Google applied this penalty on a very granular level. This penalty only affected one page out of 22 million. This page was an unmonitored WordPress blog. Small business websites don’t tend to have 22 million pages. A spam heavy page on a ten page site will receive a severe penalty. You could take the approach of only allowing approved content. 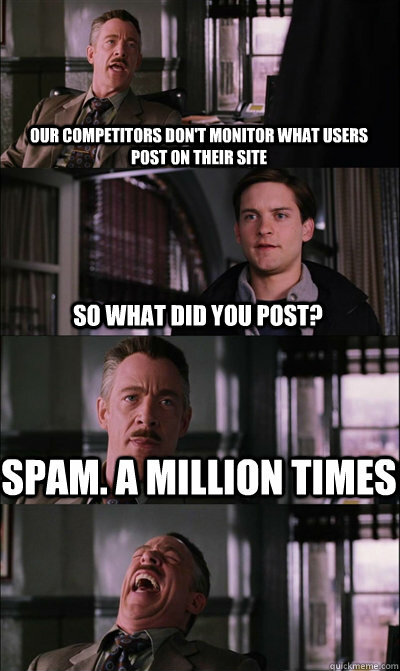 This will prevent spam, but it will hamper the community you are building. By creating a delay users will find trouble communicating with one another. Also, you may need to hire people just to check your website. I would not recommend this heavy-handed approach. You could take the approach of closing old threads. It’s possible that someone may come across the page at a later date and wish to add a comment, but this is very rare. A typical small business will only find comments for the first week or so of a blog. This may vary depending on your community. I would definitely recommend this approach. We close comments on our blog posts after two weeks. Your time frame may vary. Another approach is to apply filters to comments. First you must apply a filter that adds rel="nofollow" to any link posted by a user. Doing this will tell search engines that you do not endorse the link. They will not follow that link and thus not spammers will receive no benefit. The thought process is that spammers will learn to move on to the next target. In truth many spammers will post and run and not see things actually worked. Still, it’s best not to prevent spammers from receiving any benefit from your site. WordPress automatically applies the rel="nofollow" to any link. Next you need a filter that scans the content for spam. Akismet is the most popular anti-spam service. It is most known for its WordPress plugin, but it works elsewhere. It is free for personal use, or $5/month for low-traffic non-personal sites. For the amount of value it can add this is a reasonable price. A definite recommendation. This post was originally published as User-Generated Content: Friend or Menace? for Brand Builder Websites.